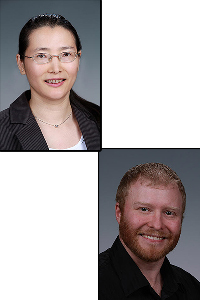 Congratulations to Dr. Dongsheng Li and Dr. David Heldebrant at Pacific Northwest National Laboratory on being selected to receive 2015 Early Career Research Program research grants. They are two of just 44 recipients nationwide -- including 17 at national laboratories -- to receive the annual research awards, and were selected from more than 600 applications. Under the program, they will receive five-year research grants that fund work designed to create new materials for energy storage and reduce carbon emissions. When tiny crystals known as nanoparticles assembly into complex, highly branched structures, they gain unique properties that can be used to channel light, promote chemical reactions, or store energy. Unfortunately, reliably making these structures is currently beyond the reach of materials scientists, because there is little understanding of what controls the assembly of the particles. Determining how they attract and repel one another is the key to manipulating the formation of larger structures. But the systems are so complex, with a constant tumult of activity at the atomic scale, that most of the rules that govern these interactions aren't known. Discovery now is mainly through trial and error. Materials scientist Dongsheng Li will use sophisticated microscopes to take a close look at how nanocrystals less than one-thousandth the width of a human hair assemble into branched structures while the process is taking place. She will measure how fast the particles move towards one another and how often they attach. Ultimately, the particles are brought together by forces between them that are caused by the arrangement of atoms on or near the particle surfaces. So Li will also measure these tiny forces and relate them to the way in which the atoms are arranged. Li plans to use atomic force microscopy and transmission electron microscopy in EMSL to make her measurements. By understanding the rules that determine how tiny crystals interact and assemble, she will take a necessary step toward the creation of new materials for energy generation and storage. Coal-fired power plants are the nation's top source of carbon dioxide emissions -- a leading culprit in climate change. For the past decade, governments and utilities have been looking at how carbon capture technologies might be deployed to reduce emission of greenhouse gas into the atmosphere, while enabling low-carbon electricity generation. Current capture technologies focus on 'catch-and-release' approaches in which the captured carbon dioxide must be placed in an environment that physically sequesters it from the earth's atmosphere. Heldebrant, an organic chemist, will use the early career award to better understand the molecular processes at work when carbon dioxide interacts with carbon-capture solvents. This understanding will provide the foundation for new 'catch-and-consume' approaches in which carbon dioxide is not only captured, but also converted into useful products such as fuels. Heldebrant will explore in depth the use of promising new carbon-capture solvents known as switchable ionic liquids. The solvents can operate at much lower temperatures than those solvents considered for carbon-capture to date, making them less energy intensive and more cost effective. They form molecular species that activate the carbon dioxide making it easier to convert, and create new, nonuniform solvent structures that can act as nanoscale reactors to promote chemical reactions. Understanding how the molecular composition of the solvent can be manipulated and combined with catalysts to promote both capture and conversion of carbon dioxide holds the promise of creating energy-efficient, cost-effective, carbon-neutral energy generation. For this research, Heldebrant plans on leveraging nuclear magnetic resonance capabilities in EMSL, the Environmental Molecular Sciences Laboratory, a DOE national scientific user facility at PNNL. The Early Career Research Program, now in its sixth year, is managed by DOE's Office of Science and annually awards research grants to young scientists and engineers at U.S. universities and national laboratories. The grants are designed to bolster the nation's scientific workforce by providing support to exceptional researchers during the crucial early years of their careers, when many scientists do their most formative work. To qualify, a candidate must be a lead researcher for a well-defined project and have received a doctorate within the last 10 years. See the PNNL press release for more details on the award and PNNL's winners.